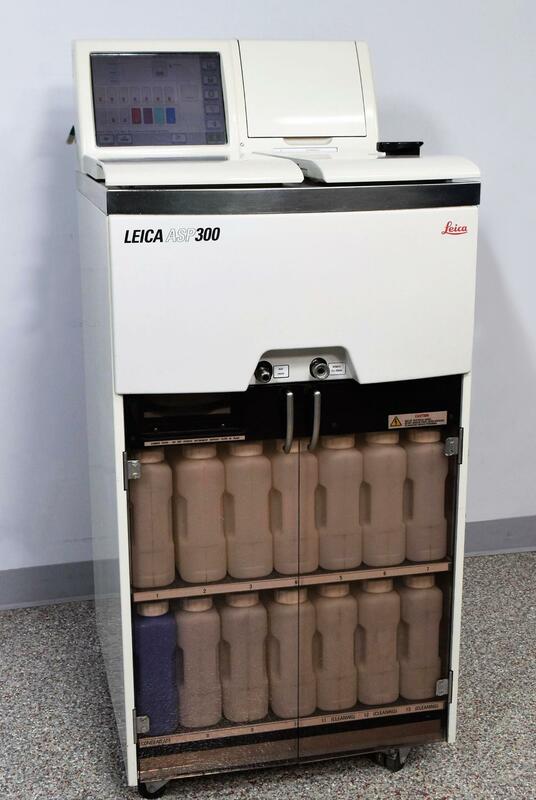 Leica ASP300 Automated Vacuum Tissue Processor Histology Pathology ASP300 . New Life Scientific, Inc.
Cleaned, Tested, and Functional. 90-day Warranty. As we do with all of our tissue processors, this Leica ASP-300 tissue processor has been tested and refurbished by our in-house technical staff and is ready for years of service in your lab. Unlike other casual sellers, we offer you the security of having tested all aspects of this instruments, and including a 90-day warranty. The rotary valve was cleaned by running xylene and alcohol through all ports. Seals on the reservoir bottles, ovens, and retort were cleaned and the system is functioning properly without leakage or blockages. After testing, we flushed the system with alcohol to clean the lines for storage. New Life Scientific is a regular seller of a variety of models of tissue processors from Sakura, Leica, and Shandon. We have experience in servicing and repairing them and know how to ensure they are functioning properly. We don’t just power on our instruments, but we test all of their core features and repair issues. We offer you an affordable option for pre-owned tissue processors without the risk of buying an untested, unwarranted instrument from an unproven seller. Over the years dozens of organizations have chosen us as their solution, from small labs to major universities, like The Ohio State University. We realize that buying pre-owned can be unnerving and you want assurance in your purchase, so we include a 90-day warranty on our tissue processors to protect you against any equipment failure or defects. If anything goes wrong, our in-house support is only a phone-call away. In addition to our 90-day warranty, we offer you continued support from our technicians, and can offer repairs if the need arises. We have spare parts on hand and, depending on our stock, can offer exchange or back-up units in a pinch. or repair components. Often, they may have serviced it (Like our tissue processors), leaving it in better shape then when it arrived. For details, check the listing's text. specifications or is not in excellent cosmetic condition considering its age.